Ukraine it is not a destination we think about when we decide where to spend our holidays. The thruth is that the country is not receiving a lot of tourists: they have their own domestic tourism, but they don’t really have a lot of foreigners visiting the country (except perhaps in Kiev). 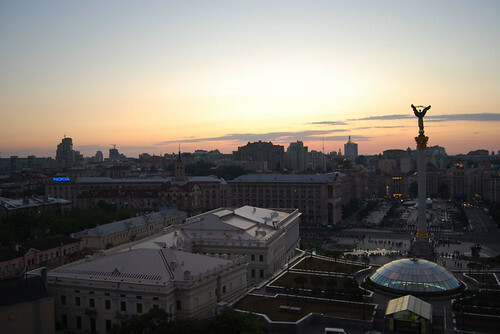 However, if you are planning to do an authentic trip, Ukraine is the perfect place to choose. At the time we travelled, Ukrainian International Airlines offered flights from Barcelona (where I live) to Kiev for a very affordable price. Planes were small, but the service was correct and the fours hours of flight passed quickly. 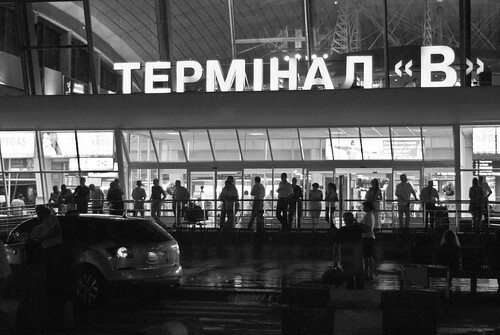 The plane landed at Boryspil airport, about an hour from the center of Kiev. Leaving the airport you are confronted with we could define as a kamikaze driving. Here nobody respects a speed limit, and they seem proud of it. Crazy overtakings and strange lane-changes are normal here. So if you catch a taxi or book a transfer from the airport to the city, reckon that you will go with a heavy heart for much of the journey. That, or you can close your eyes and apply the maxim “out of sight out of mind”. Anyway the road from the airport to Kiev is in perfect condition. So the worst is yet to come. 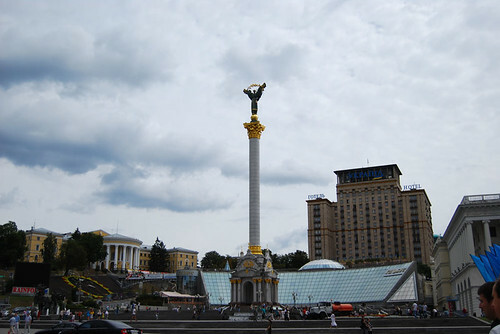 We landed at Kiev the August 18th, just days before the Independence Day of Ukraine. This holiday commemorates the “Act of Declaration of Independence of Ukraine” by the ukrainian parliament the August 24th of 1991. The act was approved at a special meeting after the conservative Communists leaders tried a coup to restore the control of the Communist Party of the Soviet Union. In Kiev this day is celebrated in style, and some days before the 24th you can see flags in the streets, militar essays, planes overflying the city, and many ukrainians with their cameras in the center of the capital. 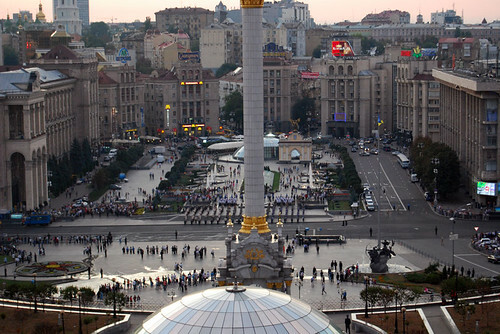 We stayed in the Hotel Ukraine, which dominates the most famous square of the city, the Independence Square. 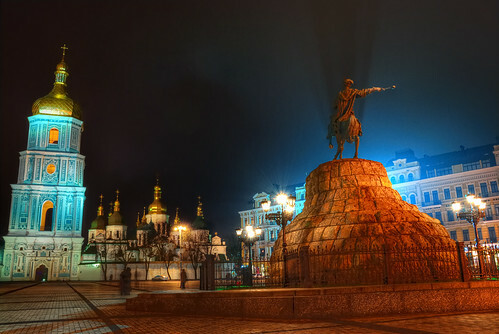 At dusk, the views from the higher rooms are really nice: the huge buildings at the bottom of the square, the statue that stands on the whole, the lights beggining to fire, the bustle moving in the streets, all of this makes this part of the city a must for those who arrive to Kiev. The Hotel Ukraine is a former Soviet building that opened in 1961. Today some of the floors of the hotel have been refurbished, but some of them are still in their original form. High ceilings, big curtains, carpeting and uncomfortable beds. But the situation of the hotel is perfect to move all around the city. Besides, the breakfast is served in a room overlooking the Independence Square, and the dining room wall is formed by large windows that will allow you to see the city. 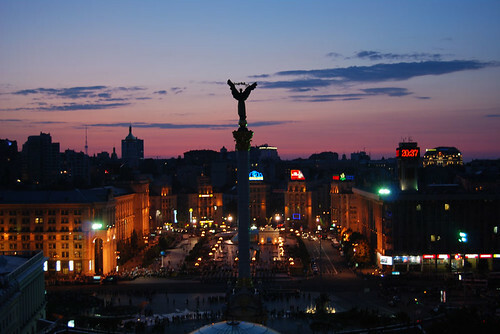 Walking from the Independence Square and following to Khreschatyk, one of the main streets of Kiev, you can find all kind of businesses, bars and restaurants. Fast food chains as Mc Donalds, of clothes like Mango, restaurants with all kind of cuisine: local, Italian, French but specially Japanese, Chinese, Indian and all kinds of oriental cuisine. 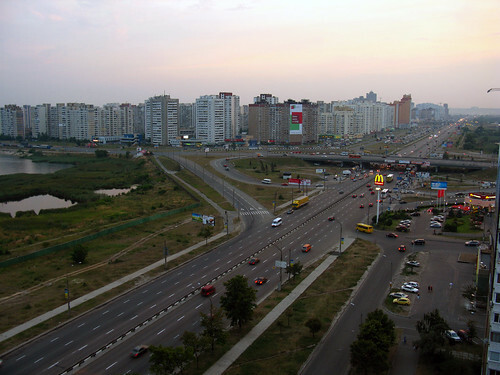 Relatively close to its communist era, Kiev is full of symbols of the Soviet totalitarism. 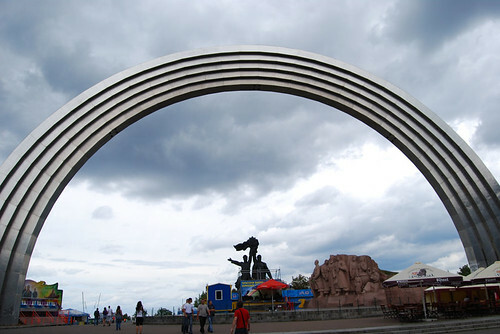 One of the examples can be found in the Khreschatyk Park, where there is a 50-meter arch symbol of friendship between Russians and Ukrainians, and that was called Friendship of Nations Arch. We can find another of the representative figures of the communist era in the Motherland Monument or Rodina Mat, a huge warrior figure that can be seen from several miles away from Kiev. After crossing the Friendship Arch you arrive to a viewpoint that controls the entire city. 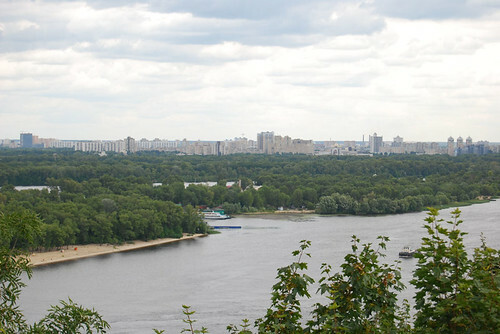 From here you can see the Dnieper river, green areas around its margins, and the quantity of monolithic buildings that form the city. The most impressive image is definitely see one of the major rivers of Europe crossing the gigantic Kiev. 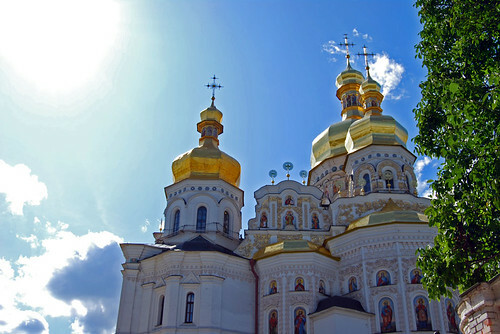 Kiev has many churches scattered throughout the city. 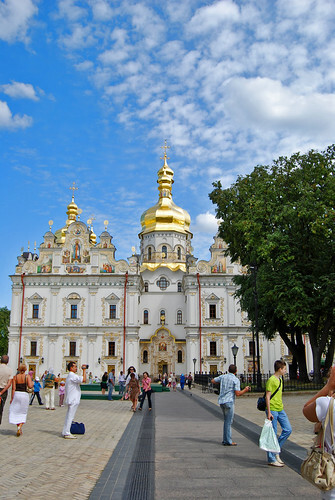 One of the most famous set of churches is the Lavra Monastery (Kyievo-Pecherska Lavra), the oldest in Ukraine and one of the most sacred for the Orthodox church. Golden domes, glittering colours in a nuclear white, souvenir stalls, all accompanied by strict rules governing the area. 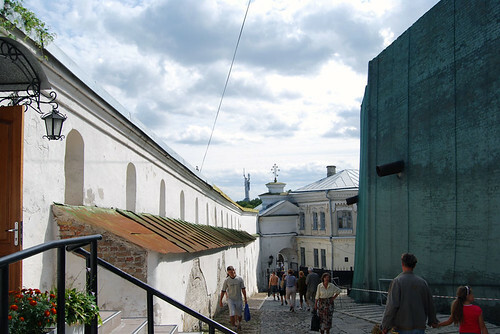 Women have to wear a head scarf, and the entrance to the caves containing the relics of the monastery is not allowed if you don’t wear skirt. Warning: they take it very seriously, so as far as you try you won’t enter to the caves if you are a woman and you don’t wear skirt (at the rest of the complex you can move around with the head scarf only). As an anecdote, I knew of the head scarf and I was prepared, but I didn’t have read in any place the obligation of wearing skirt. So I was really disappointed we couldn’t enter to the caves after walking 3 hours to arrive to the Monastery. Of course we returned to the hotel by metro. On the third day of our arrival to Ukraine we visited the place that forced the world to reflect on the dangers of the nuclear power: Chernobyl (see this post). 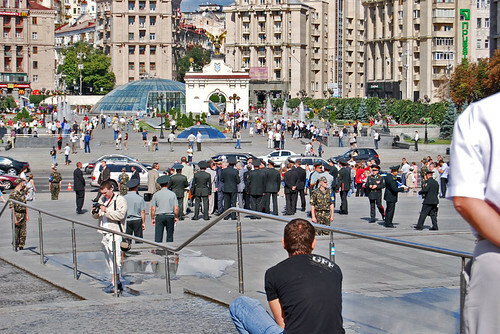 The day we left Kiev there was a security deployment in front of our hotel. Continuing with the celebrations of the Independence Day, a few personalities guarded by uniformed soldiers were meeting in the main square of the city. 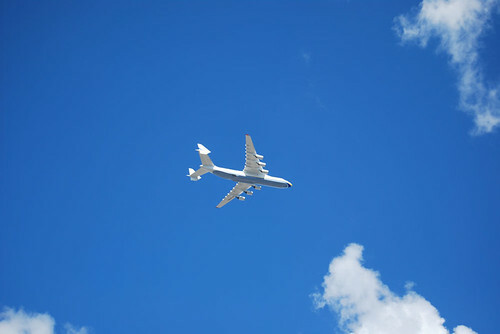 An exhibition of airplanes was passing overhead. 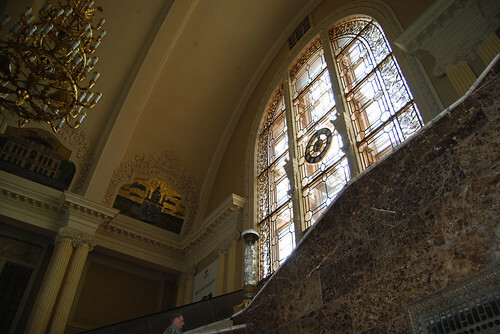 We stopped a while to watch the celebration and then, with suitcases in tow we headed to the subway to get to the next destination: a train that would take us to the south of the country, the Crimean Peninsula.